As you all know, I gave Lorelei (my computer) a complete overhaul on Wednesday. 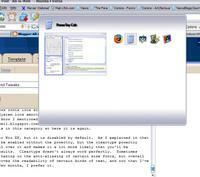 In the process, I made a lot of changes to the system software and improved a few things along the way. Over the coming week I'm going to talk about the various changes I made to the standard WinXP pro installation, and offer a little bit of advice. Today, I'm going to talk about Toys. Powertoys, actually. In particular the Windows XP powertoys. According to the Microsoft website, "PowerToys are additional programs that developers work on after a product has been released to manufacturing. They add fun and functionality to the Windows experience." I say that they are more than that, for serious computer users, Powertoys fill some gaping holes in the Power-User Experience. There are five powertoys that I love and will gush about today. All of them can be downloaded from the Powertoy's website. For your convenience, I've also linked their names directly to the download path for each. Bear in mind that the Windows Powertoys are not considered supported software and neither I, nor Microsoft Corporation takes any responsibility for any damage you might do to your machine in the process of installing or using these programs. Not my fault, please don't sue me, "you'll shoot your eye out, kid", yada yada yada. This is the most powerful of the powertoys. If you've been involved with computers as long as I have, there are days you have wanted to modify the most minute of details about how your user interface responds. Tweak UI gives you control over all sorts of little details. It lets you modify everything from simple tasks that are easy to change other ways (like how many lines the mouse scroll wheel moves your documents) to things that have always driven you just a little nuts (you can use it to deny programs the ability to "change focus" and even how many times a program flashes in the taskbar when it wants your attention) to miniscule details that make your daily windows experience just a little smoother (like modifying the length of time that windows takes to detect "hover" as shown above). There is a different TweakUI program available for the older versions of Windows. You can find it at the Annoyances.org TweakUI site. TweakUI is a must for the power user. Once you've played with it a little, you'll wonder why you didn't demand it years ago. Are you an Engineer? Math Student? Business major? Ever wish you had a windows calculator built right in that actually did something more useful than just the basic functions? Ever sigh with frustration over sequential commands on that half-assed "scientific" model when all you really need is a command line style interface, ala the Texas Instrument graphing calculators? 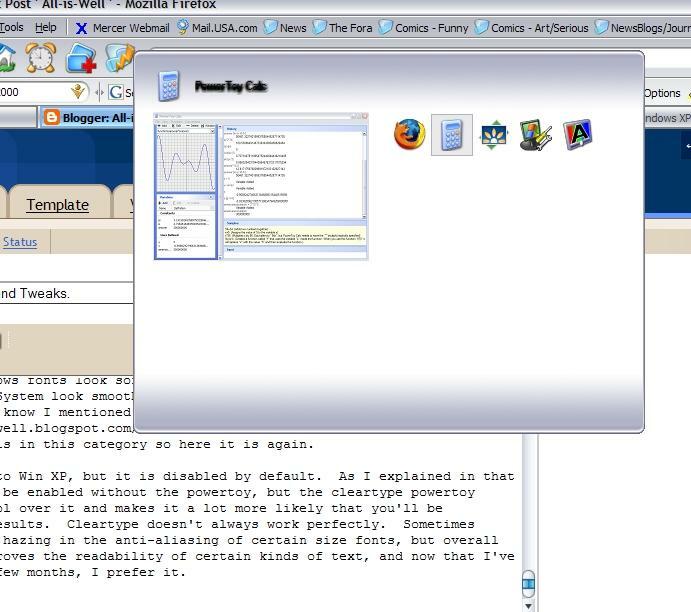 Powertoy calculator solves all those problems. 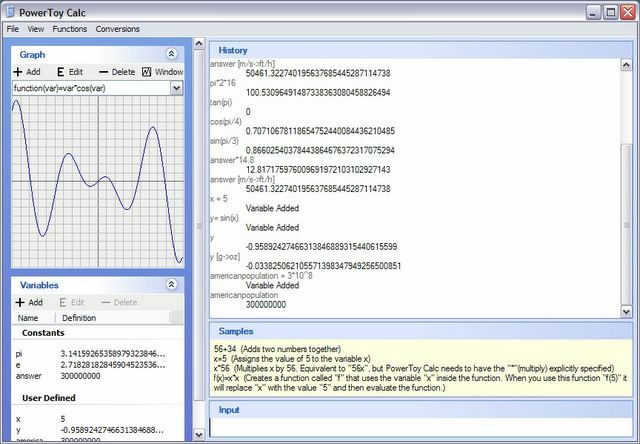 Dynamic Variable and Constant listings, a graphing window, and a command line interface make this a powerful tool. Moreover, it includes allows user defined functions, and includes automatic conversions for length, mass, time, velocity, and temperature. This is one of the first powertoys I ever used, and I still find myself using it whenever I have simple math work to be done. Ever wonder why Windows fonts look sortof sharp around the edges, and fonts on the Macintosh Operating System look smoother or more rounded? It's because MacOS makes use of Cleartype. I know I mentioned it in an earlier post, but it falls in this category so here it is again. 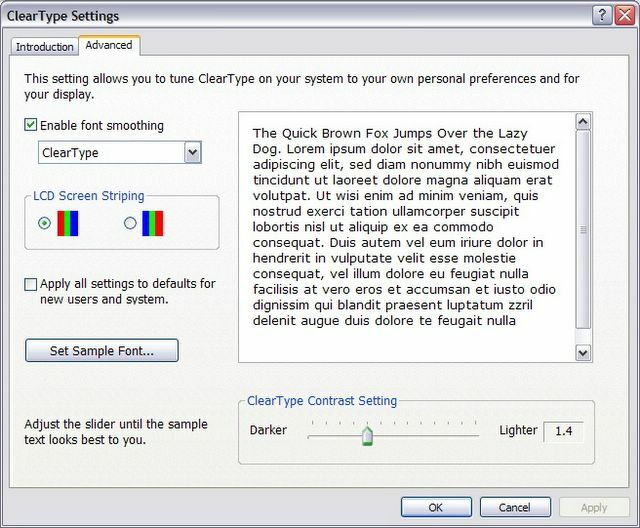 Cleartype is native to Win XP, but it is disabled by default. As I explained in that earlier post, it can be enabled without the powertoy, but the cleartype powertoy gives you more control over it and makes it a lot more likely that you'll be satisfied with the results. Cleartype doesn't always work perfectly. Sometimes you'll get some blue hazing in the anti-aliasing of certain size fonts, but overall it significantly improves the readability of certain kinds of text, and now that I've been using it for a few months, I prefer it. This is a handy little modification to an existing WinXP feature. As you (should) know, you can use Alt+Tab to switch between multiple windows or programs in any Windows Operating System. 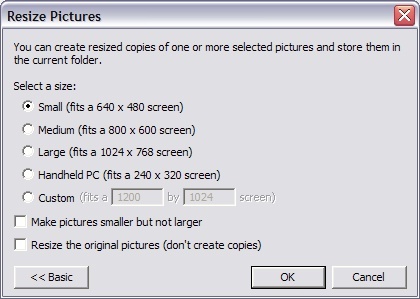 In WinXP, when you do this, rather than jumping automatically the system just shows you a list of the icons and the name of each option, you tap Tab to cycle through them, and release Alt to jump to your selection. With the replacement, a thumbnail of that window is now available, making it easier to choose the correct window if you have multiple instances of the same program running, or if you're using a multi-window program like The GIMP. This is a great little addition to Windows. It's just an explorer addition that gives you the ability to resize any supported image (I've used it for JPEGs, BMPs, PNGs, and GIFs) with a simple right click. So the next time you want to toss an image into an e-mail, you haven't got to laboriously open the source image, edit the size, and resave it. Now it's all done with a couple of mouseclicks to select size (there are four convenient standard sizes, or you can set a custom size if you prefer) and a resized copy of the image is created right there in the same folder, so you don't even lose the higher quality original. Well, there you go. There are more powertoys that I don't use, but that you might find handy depending on the tasks your perform daily. I hope you find all the extra functionality as helpful as I have.